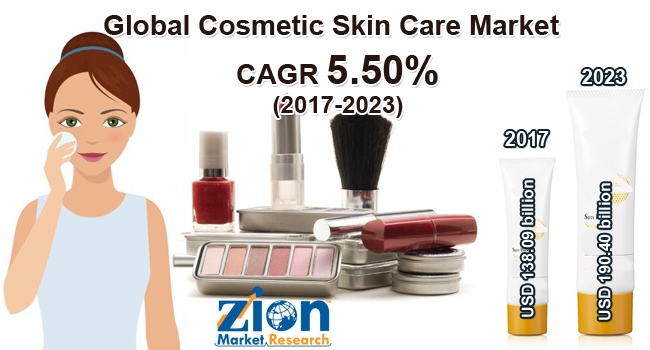 With the presence of a large pool of participants, the Global cosmetic skin care market is displaying a highly competitive business landscape, finds a new research report by Zion Market Research (ZMR). L'Oreal S.A., Unilever PLC, Procter & Gamble, Beiersdorf AG, and Avon Products Incorporation are some of the key vendors of cosmetic skin care across the world. These players are focusing aggressively on innovation, as well as on including advanced technologies in their existing products. Over the coming years, they are also expected to take up partnerships and mergers and acquisitions as their key strategy for business development, states the cosmetic skin care market study. Citing an instance, on September 10, 2018, InSpa Corporation declared launching of InSpa InSta Facials, a customized skin care service ensuring results in only 30 minutes, at its Bellevue Square location on September 22, 2018. Reportedly, the new service is expected to include Skin Authority’s clean skin care brands without dyes, fragrances, microbeads, and parabens as its ingredients. As estimated in this report, the global cosmetic skin care market stood at US$ 138.09 billion in 2017. Witnessing a tremendous rise during the period from 2017 to 2023, the revenue in this cosmetic skin care market is expected to reach US$ 190.40 billion by the end of the forecast period. The main product types available in this cosmetic skin care market are moisturizers, facial masks, anti-aging creams, cleansing lotions, shaving creams, toners, sun care lotions, eye creams, serums, and exfoliators. Among them, the demand for anti-aging creams is relatively higher and the trend is anticipated to remain so over the next few years, notes the cosmetic skin care market research report. “Growing awareness pertaining to adverse effects of pollution and ultraviolent radiations on skin is projected to stretch the growth curve of cosmetic skin care market in the years ahead,” says the author of this cosmetic skin care market study. Apart from this, today women are diagnosed with skin related disorders & allergies due to use of chemicals in cosmetics. This has resulted in consumer shift towards use of natural or organic cosmetics as well as cosmeceuticals, thereby stimulating the cosmetic skin care market size. Regionally, North America has been leading the worldwide cosmetic skin care market and is anticipated to continue on the dominant position in the years to come, states the cosmetic skin care market study. Tremendous popularity of skin care products along with inflating youth population is the main factor behind the dominance of the North America cosmetic skin care market. The presence of major players in North America is another significant factor that is supporting the growth of this regional cosmetic skin care market. In addition, rise in the sale of anti-aging creams as a result of increase in the aging population will further augment the business space.